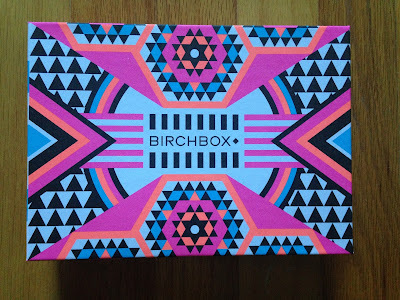 My July Birchbox finally arrived yesterday! It was a very long wait this month. Usually boxes ship around the 10th of the month and your box is updated in your account and you can check out what samples you'll be getting. This month I never received a shipping notice and my account never updated with what I'd be receiving. I called Birchbox Customer Service (which is always amazing and so easy to deal with) and they got my box and my Birchbox plus items to me in no time! I never worry when something goes wrong with my subscription to Birchbox, because their customer service is seriously the best. Everyone I have ever talked to is the sweetest and always very helpful and fix my issue within minutes of calling, whatever it may be. I wish all companies would model their customer service after Birchbox! I'll start with the Birchbox Plus items I ordered for the month. I believe I mentioned them when I reviewed my last box. 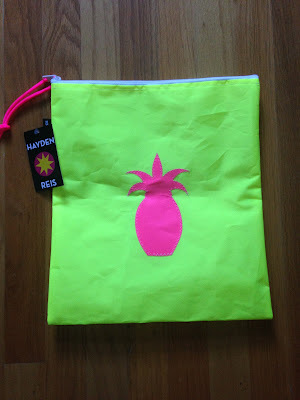 The first item I added on to my box was the Hayden Reis Pineapple Sail Cloth bag. This is very bright and I have a thing for pineapples, so I had to get this. I will use it to put stuff in when we go sailing! How appropriate?!? 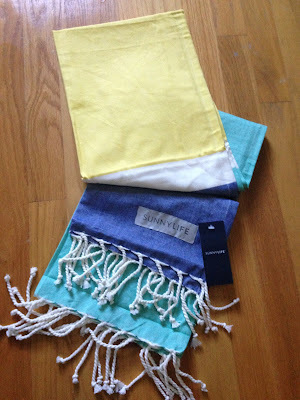 I also added the Sunny Life Fouta Towel in Sorrento. I love the blue, yellow, and teal colors of this towel. That is my favorite color combination! 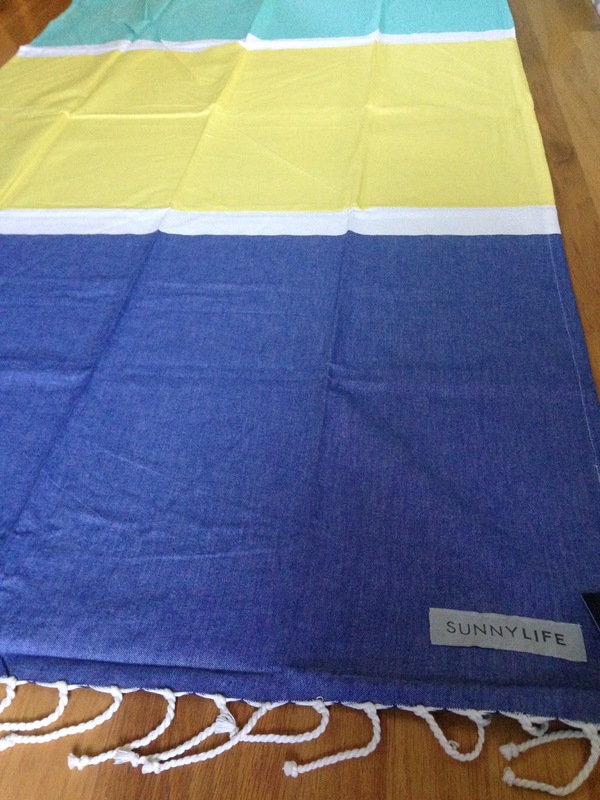 This is a large size towel 175 x 90 cm. It's very long which I love and a great weight cotton fabric, similar to a chambray shirt, which is what this towel reminded me of. I also love the fringe on the edges. I was very impressed with this towel in person and so happy I ordered it. I wish I would have ordered this in both colors that were offered. I'm regretting that a bit. It was so long I couldn't get a good picture of it all in one shot. 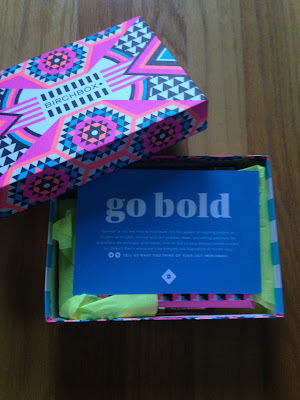 Now onto my regular Birchbox subscription box for July. It was worth the wait because I received the best box ever...at least in my opinion! I loved the box design this month. 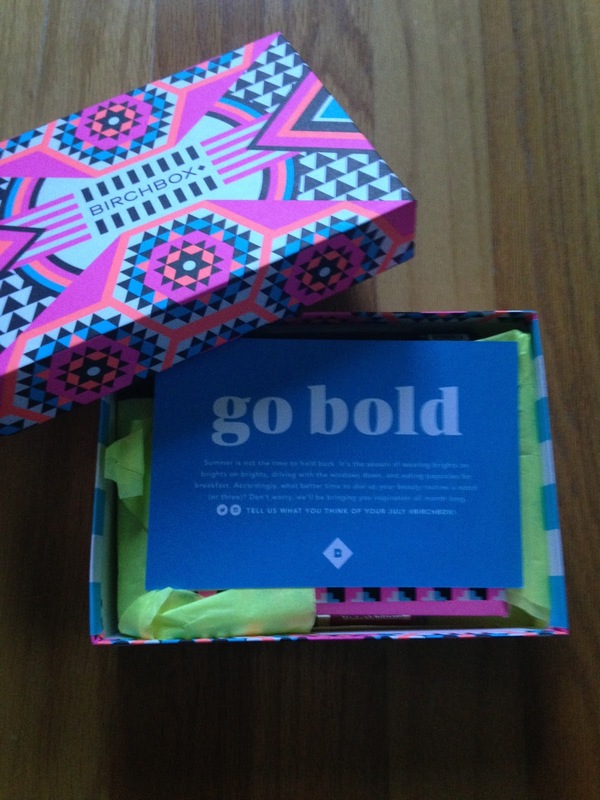 It is so bright and I tend to use my old Birchbox boxes to put gifts in and I know exactly who will love this one! It looks like it could glow in the dark! I love it!!! Here is the first look when I opened the box. The theme this month was "Go Bold". It's all about brights this month! Birchbox always includes an information card explaining everything in the box. This month there was also a offer from Benefit included, because Birchbox now carries the line. The sample choice this month was a Stila Look At Me Liquid Lipstick in a choice of 3 colors. I chose Venezia. I believe I picked the shade that looked lighter and more wearable than the other two. They were all very bright and not me at all, but definitely went with the theme of the box. I tried to use the tiniest bit for just a hint of color, but there was no way to do that. 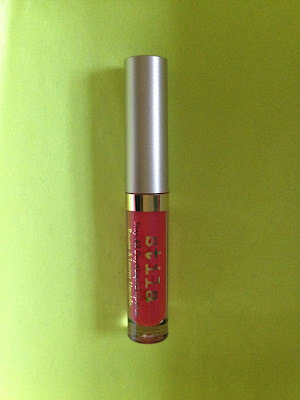 Even the tiniest dot of lipstick provided very bright color. It felt soft, but was not moisturizing enough for my liking. I prefer gloss or tinted chapstick over lipstick, but that's just my preference. This did not work for me at all. I am not a girl that can wear a bold lip confidently. It probably would look great on someone that can though. The next sample I received was Amika un.Done Texture Spray. 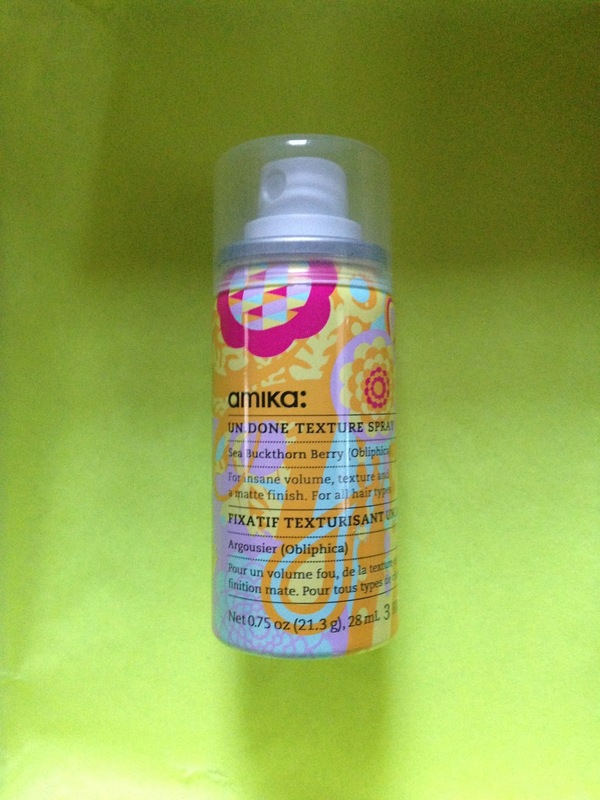 I love Amika products! This smells amazing as I expected. It works well to give my fine hair some much needed volume. 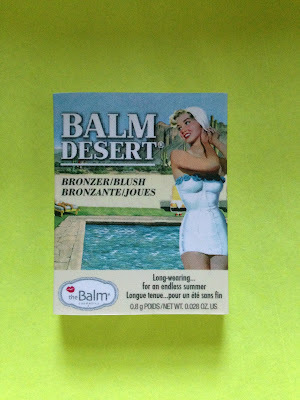 I was very happy this product was in my box this month! I also received Coola SPF 30 Organic Makeup Setting Spray. I received a similar Supergoop! product in my Popsugar Must Have box this month and was happy I'd get to compare the two. They had a similar scent when I sprayed it, like sunscreen and hair spray. It didn't feel sticky on my face after it dried and left a matte finish for hours. I'm a big fan of these sprays and I'm so happy about the sample size of this, so I can take it on my business trip Monday. Yay! 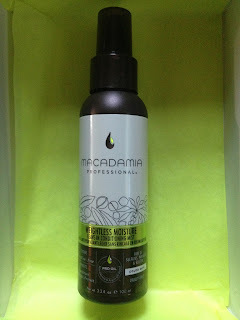 The largest sample I think I've ever received in a Birchbox was this Macadamia Professional Weightless Moisture Leave-In Conditioning Mist. This was almost the same size as my Birchbox. It's a very generous sample size of 3.3 fl oz. I love it! 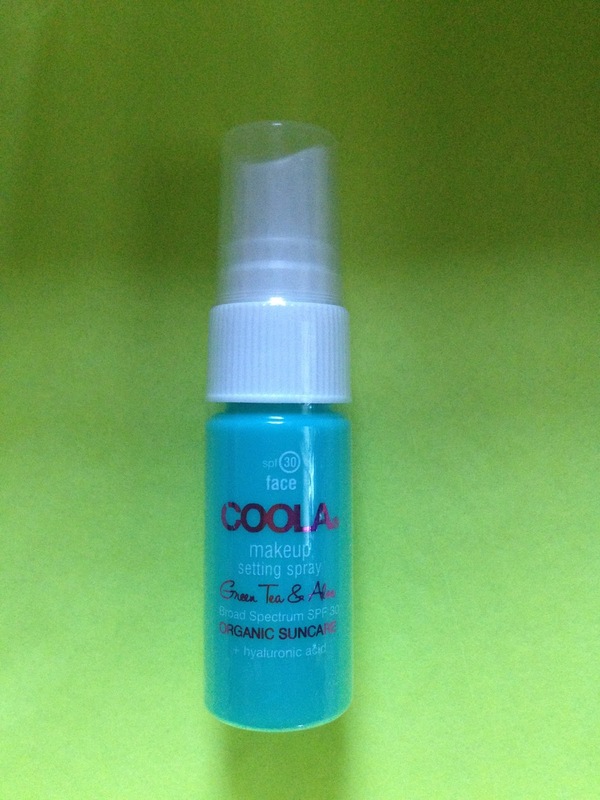 I really like spray on leave in conditioners and this one smells great and works wonderful. I was so happy I loved this, since this sample will last a long time! The final sample I received was theBalm cosmetics Balm Desert bronzer. This is a great bronzer! It's not too dark for my pale skin and gives my skin a pretty sun kissed look. 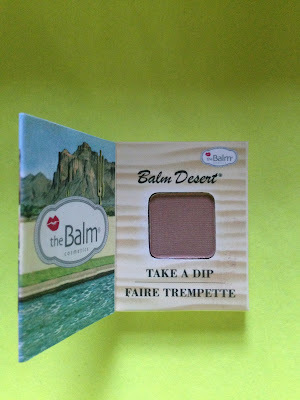 Plus I always love the fun packaging of theBalm products! 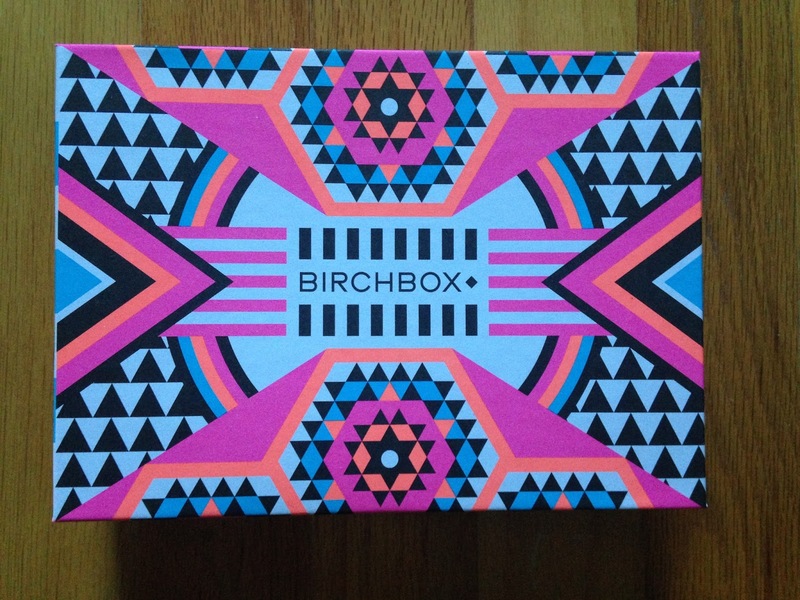 I'm so happy with everything I received this month in my July Birchbox! I also have to say how easy it has been to travel this summer bringing Birchbox samples, because the small size lets me fit tons in the quart size bag when I fly. So I don't have to buy cheap drugstore brand products to travel with and my skin continues to look flawless while traveling. 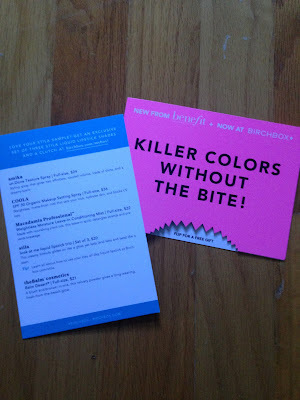 They have already released the sample choices for August and the Birchbox Plus items. The Birchbox Plus items were great again, but I decided not to add any on to my August box in an attempt to save a little money. Plus when I checked, the items I had wanted have already sold out. I hope my August box makes me as happy as this month did!